Villa Marina has a living room with two-seater sofas and armchairs which convert to comfortable beds, coffee table, fireplace, TV, Radio-CD player and air-conditioning. There is a fully equipped kitchen with dishwasher, cooker, fridge and dining table for four people. 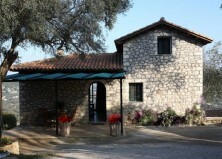 The villa has two bedrooms (one double and one twin) with private bathrooms, washing machines and air-conditioning. Downstairs there is a separate one-bedroom autonomous apartment with twin beds, a fully furnished living room, a fully equiped kitchen, a bathroom, a seperate entrance and sea view. The house offers a garden with a pool, table and chairs and sun beds with umbrellas. Villa Marina is one of the “Gatsoulis Villas”. These newly built villas can each accommodate 6 (six) people, they are fully furnished with air-conditioning and fully equipped with individual pools.